Who are the independent real estate brokers ? The independent real estate brokers are brokers who have a license issued by the OACIQ and who act independently, outside of the franchisors structures. According to information of major real estate agencies, the franchisor is a company who gives at other agencies, the right to use and exploit its brand and its system, according to the terms and conditions of a contract. Real estate broker who work for this agencies have the same rights and the same limitations. Among the most popular, can be mentioned Remax, Sutton ou Royal Lepage. In a other way, independent agencies are real estate and mortgage agencies which act independently, outside of the control of the franchise and only refere to recognized real estate institutions like OACIQ, CREA and QFREB. We can recognize some "mega real estate agents" among independant agencies like Proprio Direct or Pro Real Estate & Mortgage. Besides the independent agencies you can fin many experienced brokers who work for themselves. 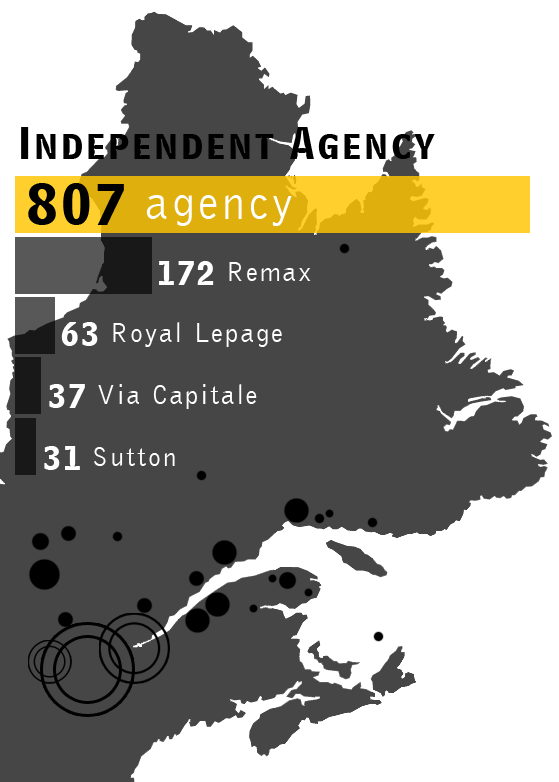 Beside, 41% of all real estate broker in Quebec province are independent realtor. They are the largest group of professionals real estate in the province. You can find them in all regions, working in over than 800 agencies and they cover all specialties of real estate and mortgage brokerage, from residential to commercial, through the agricultural, industrial, leasing, land and fields, etc. For research, a purchase or mortgage uncomplicated and secure, consumers have all benefits to hire an independent real estate broker RCIIQ member. He's supported, well equipped and is working with many other professionals working in sectors related activities to succeed the more important transaction of a life. By hiring a real estate broker licensed by the OACIQ, you are eligible at the FARCIQ insures Québec real estate and mortgage agencies and brokers against professional liability, which offers the public protection in case of fault on the part of the broker. The Organisme d'autoréglementation du courtage immobilier du Québec (OACIQ) is a non-profit organization created to protect the public by overseeing the work of Québec real estate and mortgage brokers and ensuring the enforcement of and compliance with the Real Estate Brokerage Act. CMHC also informs citizens on a legal level by the information transmitted by the Government of Canada. As a consumer, you take informations about buying a house, mortgage loan insurance, renting a home and programs. You can obtain documents that advise you and guide you in all your real estate transactions. Start to the recruitment of his members, a credit investigation is conducted by the RCIIQ. A verification of the professionnal past of the realtor also executed. In addition, all realtor guilty of a breach of professional ethics is banished from his ranks. He can not be displayed member RCIIQ although the Act allows it to exercise again. By his severity, this real estate selection is unique in Quebec. The RCIIQ is the only official organization to impose such rules to the brokers. Therefore, the RCIIQ confirms the professional attitude of its members and guarantees consumers, integrity and professionalism, and authorizes the quality seal of RCIIQ on display members as a token of gratitude. RCIIQ members are well represented throughout Quebec thanks to the signs of the RCIIQ that provides family look while promoting the individuality of each agency and broker. In addition, they have access to a multitude of tools that allow them to promote their properties, to secure their transactions, to provide competitive expertise and work with a team of professionals.